The exhibition brings together nineteen artists to complete site-specific commissions and installations in four brick houses on Colonel’s Row. Part of the fun is simply snooping around the old houses—with notebook in hand, peeking around corners, checking out kitchens, I felt the thrill of house hunting and the accompanying and unavoidable sensation of self-projection into the livable space. 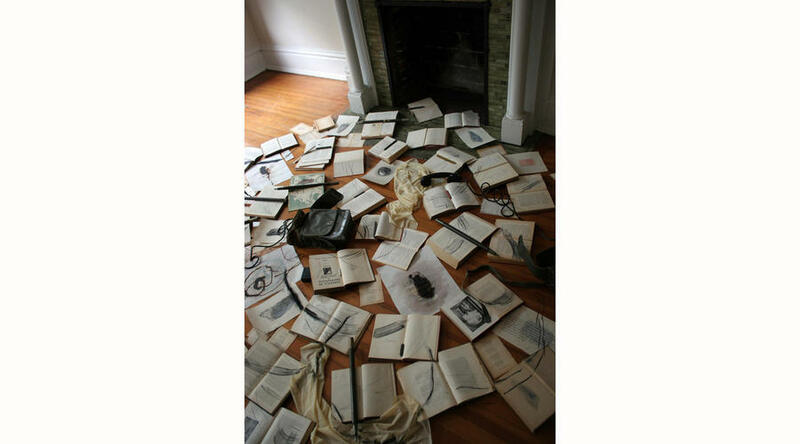 True to No Longer Empty’s manifesto, there are no blank slates or gallery walls, but the art pieces interact with, envelop and inhabit their spaces, engaging with the history, past lives, and unique properties of the architecture. With every turn, every door opened, the curatorial statement was upheld with a certain grace and commitment, the stately homes transformed into immersive environments drawing out and playing with the particularities of their place in space and time. For a cogent contrast, the neighboring exhibition by the Sculptor’s Guild uses the house as if it was a gallery, the sculptures merely set inside with minimal interaction with the architecture. This is not in any way to the detriment of the artwork—the sculptural work is excellent and in many cases quite impressive—but the contrast reveals how very different the two exhibitions are in intent and mission, and underscores how successful the Sixth Borough is in really engaging with the space and its history. Communication with the past, memory and the metaphysical properties of the sites proved ripe areas for exploration for many of the artists. 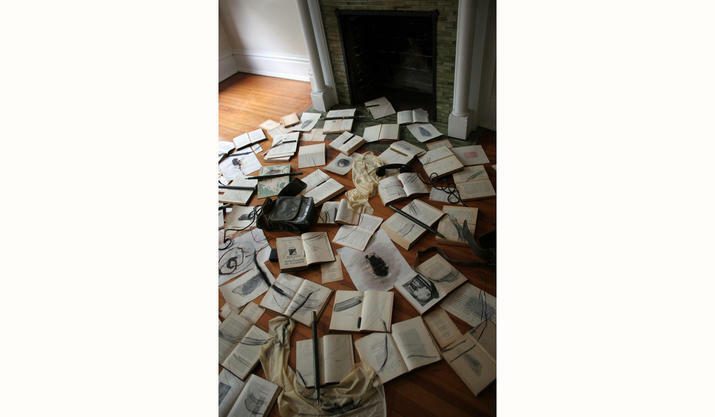 Monika Weiss’ installation of books ritually burned and marked with charcoal and Kaarina Kaikkonen’s sewn-together dress-shirts encircling a table and chairs, evoke a spirit of meditation, séance, and a desire to communicate with the spirits of those long gone from these spaces. The architecture itself proves a playground for artists like Adam Cvijanovic, who, inspired by the many-doors-syndrome (endemic in Victorian times) of the house, multiplies them in a trompe l’oeil mural in one of the rooms. The curation and installation of the Sixth Borough is absolutely stellar. 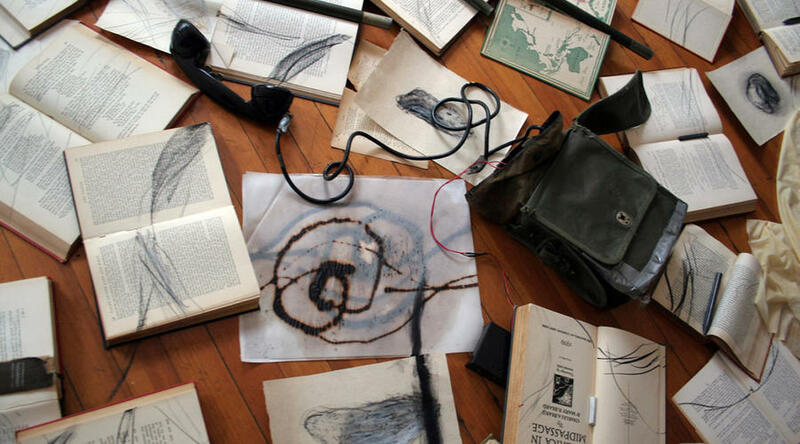 The artists’ works communicate fluidly with each other, with the space, and with their place in time. My only criticism is a very minor detail: the overwhelming amount of wall text, which often didn’t add to the experience of the art, but rather distracted from already very strong works. They are easy to ignore, however, but the strength of artistic vision and talent represented in this intriguing show, supported by the undeniable ambience of its setting will be hard to forget. Images: Wendy Wischer, Murmur, 2010, Coated styrofoam, mirror tiles and light, Dimensions Variable; Kaarina Kaikkonen, Hiding Memories, 2010, Shirts, Site-specific Installation; Monika Weiss, Phaos, 2010, Books, objects, drawing, projected video & sound, Site-specific installation. Courtesy of the artists.